Don't you love it when a friend shows up at the door with a shoebox full of Lifesavers, jellybeans, and ribbon and teaches you something new? I helped a friend prepare for her daughter's baby shower this weekend by constructing 50 pacifier favors using just those supplies! I'm past that particular phase, but I recognized it and swear I saw it linked up here once or twice, but couldn't find the link to save my life. Luckily, my friend came prepared to teach, so grab your supplies. Set yourself up on the back porch with tv trays so you can also watch the wiffle ball home run derby in the back yard. 1. 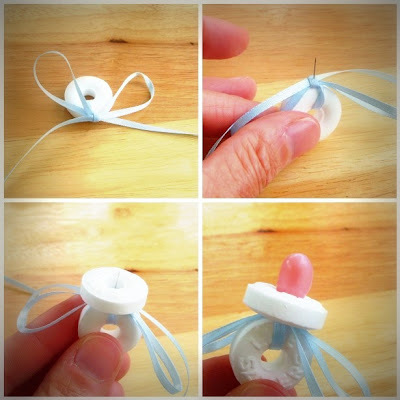 Tie a bow around one Life Saver mint. 2. Insert pin through knot in ribbon from behind. 3. Place second mint on top. 4. Stick the end of your jelly bean into the hole in the Life Saver and through the pin to anchor. You can't eat the pin unless you also popped the ribbon in your mouth. The pin is held in place by the ribbon and would come off when it was removed if someone wanted to eat it. ARGH!!!!! Too Late! Too Late!! My sister's baby shower was last Saturday. As in two days ago! Major Blog Post Timing Fail, Jen!! These are adorable! :) I'll have to pin them so I can use them later. where do you get the pins? Love them!! But also a little worried about the pin. I'm going to say that if you are that worried that your guests will eat ribbon, maybe choose another favor. It's really just a cute thing to have at the shower. You don't have to chow down on everything on a table. I have been making these for about 13 years. We use cake icing to hold them together. So people can eat them. I made these and held them together with white chocolate. They were adorable! helped do my friends baby shower & used as decoration.....done with pin, but to keep people from eating I placed in empty baby jars labeled with "arriving soon" hung on a ribbon and tag. and even painted jar lids. with plastic baby pins from Dollar Tree store, placed inside jar. and glued shut. cute cute cute...thanks for sharing..I have linked to you over at Freebies for Crafters. These are great baby shower favors! I’ve been looking for some creative baby shower decorating ideas for boys and this could serve as a decoration and a shower favor at the same time! Really cool! I want to do these for my daughter's baby shower. I wish someone could give the amount of ribbon I would need per favor. I just wanted to let you know that I think http://hopestudios.blogspot.in/ is such a great resource that I had to mention it in my latest blog post http://parentinghealthybabies.com/25-baby-shower-ideas-or-themes-for-girl/#comments. I know you are busy, so no need to reply. But if you get a spare moment, check out the post. If you like it, feel free to tweet it out. these were so cute and I got lots of comments on them definitely will do them again for every baby shower I am invited to thank you for the idea I also did not have pins so I cut a toothpick in half and used that instead.